Looking for other ways to use eggs other than consuming them?? Would you like to hold on to those cracked up egg shells instead of throwing them out? What about egg cartons? Do you already have some clever uses for those that others may not be aware of? Feel free to share! In this post I will share some of my uses and tips on how to use up everything from the egg shells to the egg cartons and of course the egg itself. 1. Do you have a compost? Eggshells make a great addition as they are rich in calcium. Tip: If you crush them prior to adding them to your compost they will break down faster. 2. Use for starting seedlings. This is a really cute one. Best to place the shells with the seedlings back in the empty carton and place near light. 3. When transferring seedlings to planting, mix in some crushed eggshells with the soil to continue to help the growth process. 4. Use crushed shells as an abrasive to scrub tough dirt from pots and pans. Just mix first with a little dish soap and water. 5. Use for craft projects. 6. Use as molds for jello or chocolate. "Blow out" the inside of a raw egg. Then using the jello or chocolate, carefully fill the eggshells to make unique egg-shaped treats. Peel away the eggshell mold before serving. 7. Use as a natural drain cleaner. This is one that I am personally happy with as we have always had issues with our drains. Just crush up some eggshells and place in the sink strainer at all times. They will trap additional solids and will break up over time and help clean the pipes when they pass through. 1. Use them to plant seedling starters. 2. Do you have a garden? Crush up some egg shells and scatter them around your plants and flowers. Certain plant eating insects such as snails and slugs do not like the shells. 4. Makes a great paint palette. Especially for little kids. 5. Makes a neat organizer for various small objects. Use for extra packing in boxes holding fragile items. 1. Suddenly find yourself needing glue for a project but have run out. Egg whites will work as a seal for paper or light cardboard. 2. Use yolks as a facial cleanser. Mix a couple of yolks together and add just a little water. It will moisturize and help keep skin healthy. 3. Use egg whites to clean and restore leather. Just crack two eggs and separate the yolks. Place the whites in a bowl and start cleaning. Following you via bloghop. Hope to see you @ my place :) Have a great day! Yes I have to agree. Reading other blogs is a great way to learn new things. 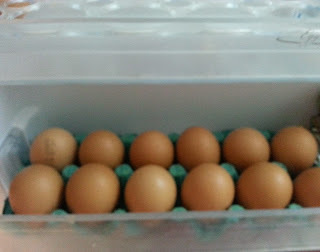 Heading over to check out your blog now and to read your post on fresh eggs and old eggs (tips). First, I had no idea that slugs don't like the eggshells - and NEEDED to know that. They destroyed half of my garden this summer...seriously. Thanks for that! My son's classroom uses egg cartons and makes cool crafts with them. The last was a school bus - it was adorable. So sorry to hear about your garden troubles with slugs. Hopefully you will have better results next summer. Egg cartons are great for crafting!